I was sad to have to miss the seaweed events at The Botanics this weekend but delighted to see that The Forager's Kitchen was mentioned in today's Scotsman. 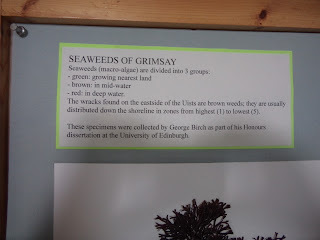 However my seaweed luck was in locally, when I spied a poster for an open invitation to the Blackland Project at a Grimsay Croft. My non scientific understanding of the Blackford Project is that it is a partnership between Uist Crofters and the University of Edinburgh, to determine whether there is any benefit in the inclusion of seaweed as a fertiliser in the old ridges (lazy beds). The project is specific to the East Uist coast using Achophlum nodosum (Bladder wrack) contrasting deliberately with the kelps used on the West Coast (The Machair). I learnt that both East and West coast seaweeds are deemed to be low in phosphates and nitrogen but high in sulphur. Somebody has already asked me why I eat seaweed, when it is purported to be full of arsenic, so I suppose a good dose of sulphur cyanide style, on the garden is par for the course. Seasonal nutrient variation has not as yet been analysed. Storm wrecked beach bounty would appear to determine when seaweed was collected. 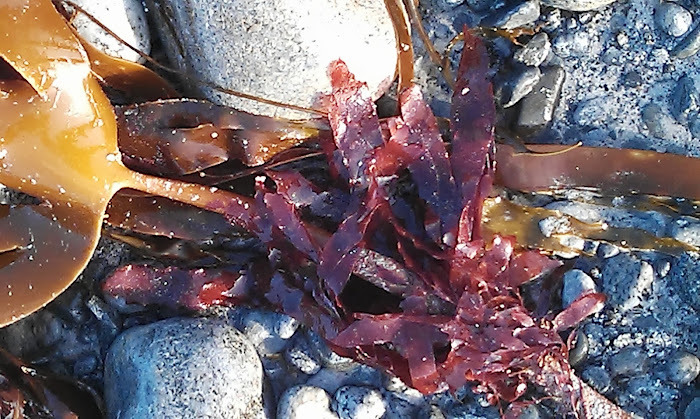 The Blackford Project has compared lengthening the time that seaweed is left to rot (four months), which is considerably longer than the traditional four-six weeks of the historic Crofter. 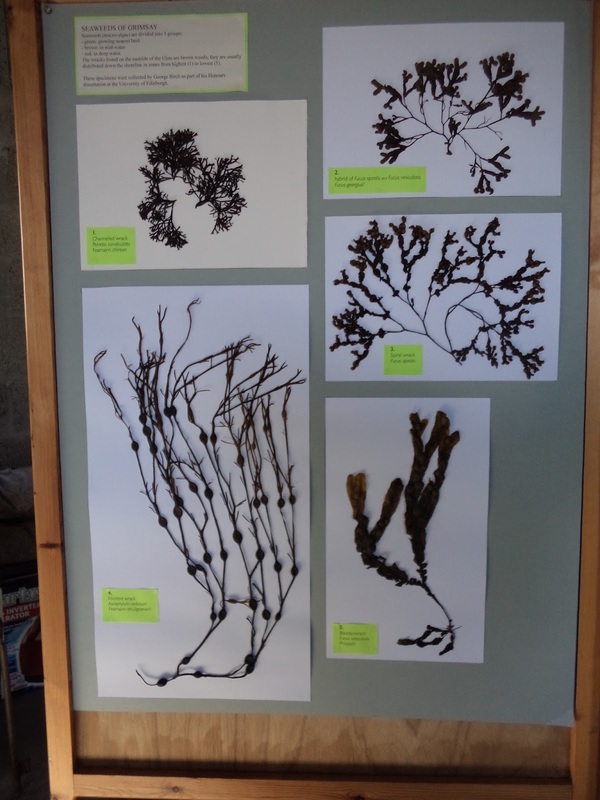 I enjoyed chatting to Raghnall MacIain who employs local folk to hand cut Achophlum nodosum (bladder wrack). He dries it in Sollas (North Uist) over wood-chips at a very low temperature which preserves the seaweed without temperature degeneration. A note for the cook here is that long and slow drying is best - seaweed is a slow food. I'd spied crofters cutting the 'stipe' (stem) from storm damaged kelp and somebody had mumbled something about its export to Brittany. I've since read that the French have a seaweed festival 'Fete du Goemon', which reenacts the traditional ways of Breton seaweed harvesting ...I can't help wondering if that beach has a nickname to compare with Benbecula's 'Stinky Beach'. Enough of this rot chat. 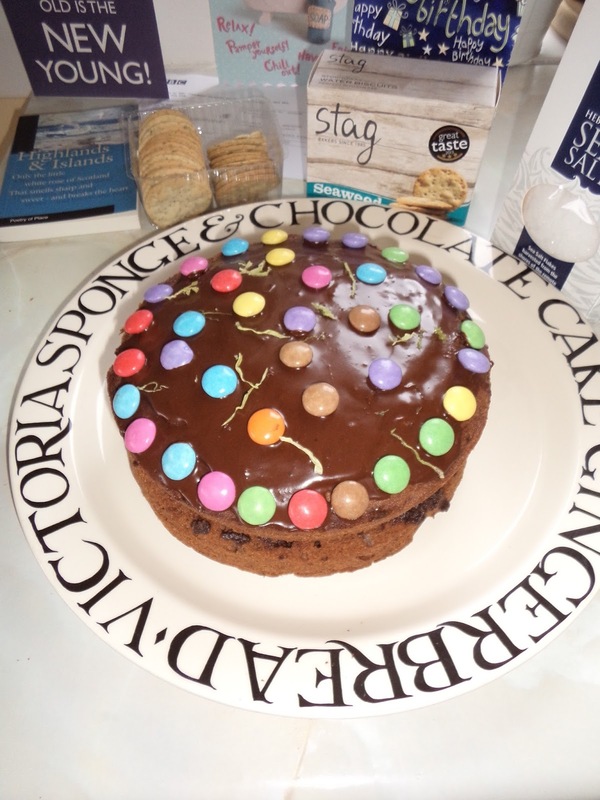 My aim is to encourage folk to cook with fresh or dried seaweed - and I endeavour to harvest it, when it is nutrient packed because the seasons make a difference. Here are some photographs from the most informative day which took place at the most delightful Mary Norton's croft. Lunch was local and delicious - hot smoked salmon sandwiches. 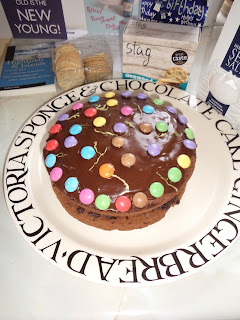 In true Outer Hebridean food style I picked up Hebridean sea salt and yet more of those award winning seaweed biscuits from Stag Bakeries en route back down to South Uist; where a green and red seaweed birthday cake awaited my long suffering, seaweed guinea pig and favourite South Uist Dr.... even a Seaweed Birthday Cake needs the odd smartie.